When you first start Movavi Slideshow Maker 3 for Mac, it will be running in TRIAL MODE. 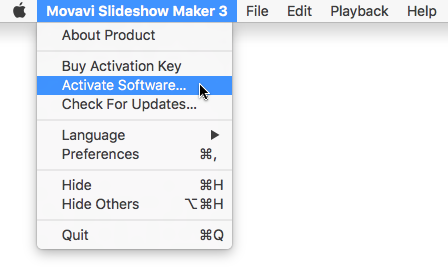 To use the program without trial restrictions, you will need to buy the full version and activate Movavi Slideshow Maker 3 for Mac. Click the button below to buy an activation key. After the purchase is completed, the key will be delivered to you via e-mail. Open the Movavi Slideshow Maker 3 application menu and select Activate software. Enter your activation key and click Activate. If the computer you have installed Movavi Slideshow Maker on is not connected to the Internet, you can activate the program via e-mail. After you have activated the program, you can open the slideshow project and re-export it without the watermark. Copyright © , Movavi. All rights reserved.